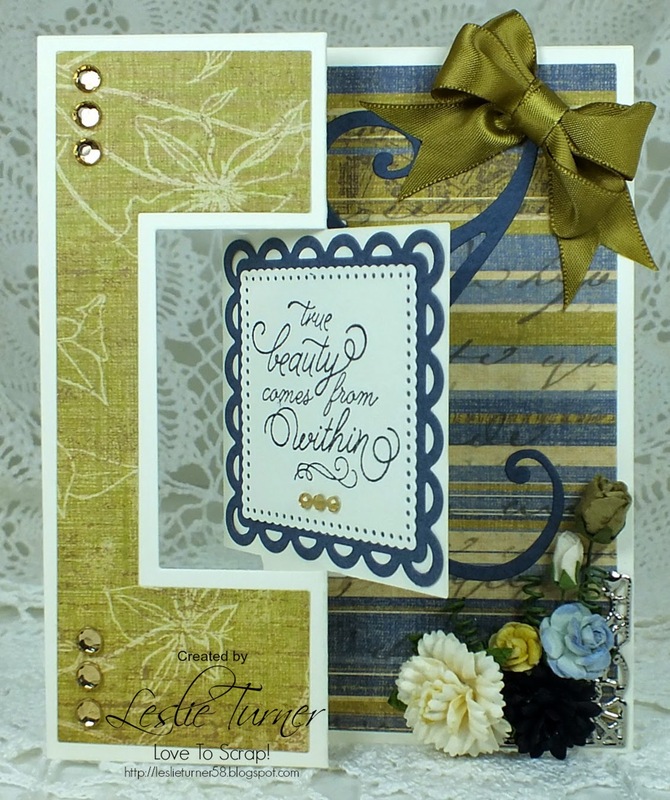 Leslie is hosting today and has chosen 'Cut it Out' for her theme. 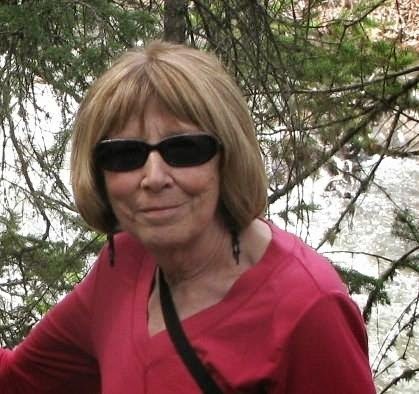 She would like to see die cutting or punching on your project please. As a family business we're a friendly, helpful, bunch at Hobby Art. 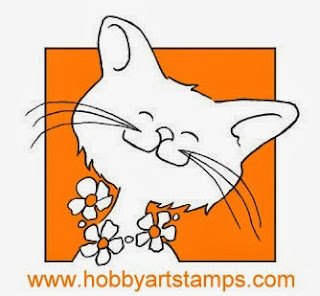 All our stamps are designed by us and manufactured in Britain. 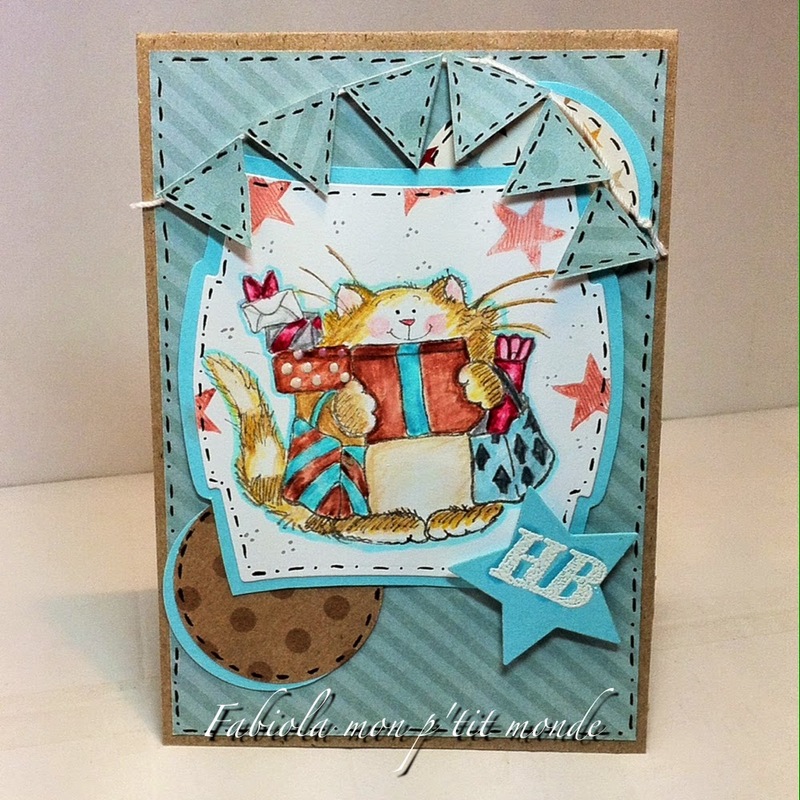 Look at the gallery on my blog - jennymayes.com - for lots of card ideas using the Hobby Art range. 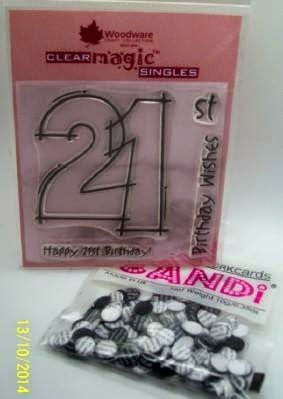 I created a fun birthday card using hexagon dies with the Big Shot and a high heel shoe cut file with the Silhouette. I added some polka dot ribbon, a filigree metal corner, gemstones and pearls. 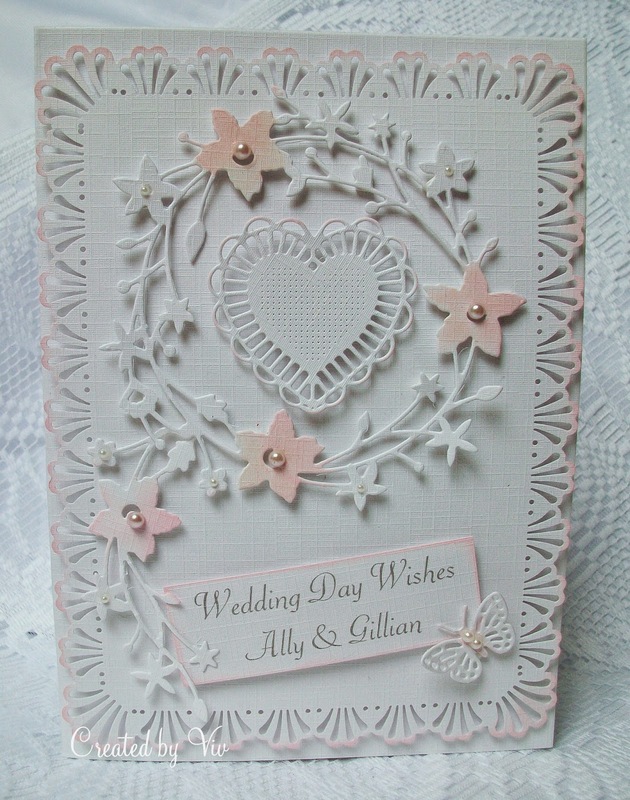 Predominantly white wedding card, using punches and dies- and a touch of ink! 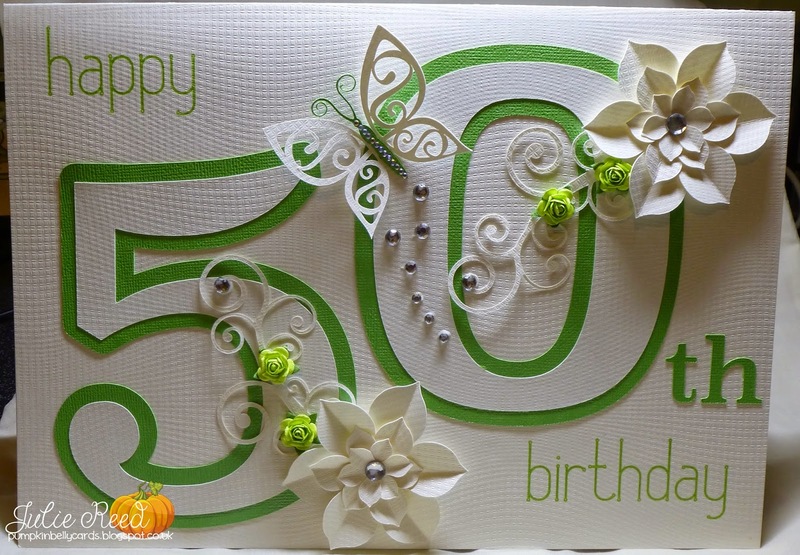 My card was mostly cut using my Cameo, in shades of cream & Green. My boxed acetate dome card was made for a 60th Birthday and I used one of my Tattered Lace dies to cut the aperture and the frames. I also used some flowers from my stash, and the last of my lovely burgundy ribbon. I reached deep into my stash and pulled out some Spellbinders dies and LaLa Land dies to put together this shiny Christmas card. Lots of gold and lots of glitter! 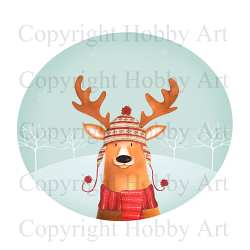 Used three die cuts for this cute but non scary card. 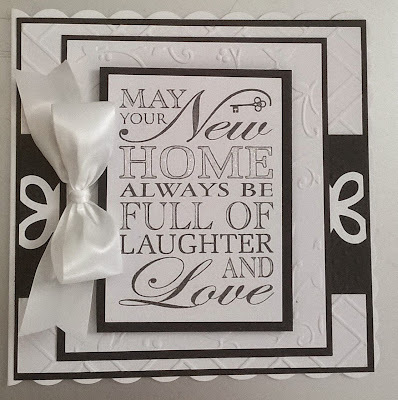 I used a die from Crafts-Too for the main image and paper pieced the different elements. 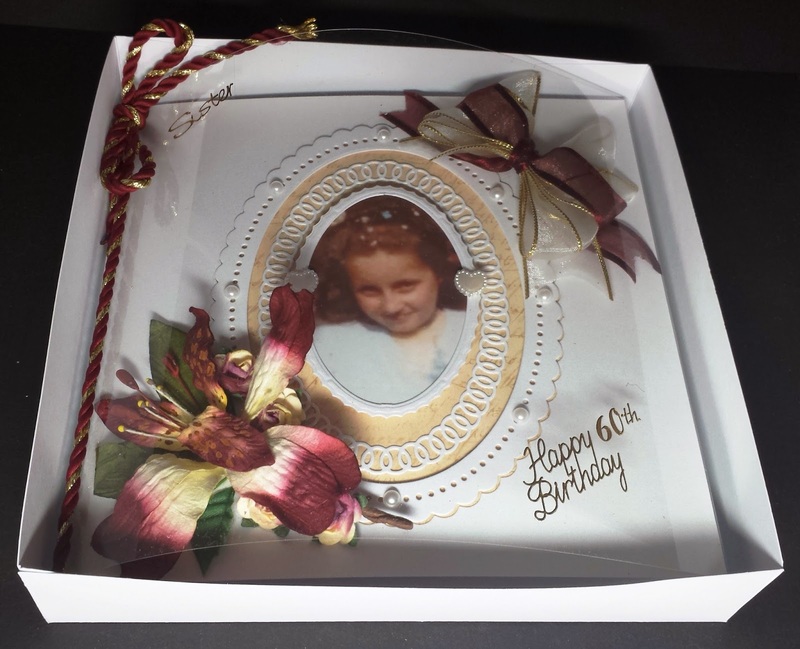 I used my Silhouette to cut the frame and embellished the card with Stickles, buttons, bows, pearls and twine. 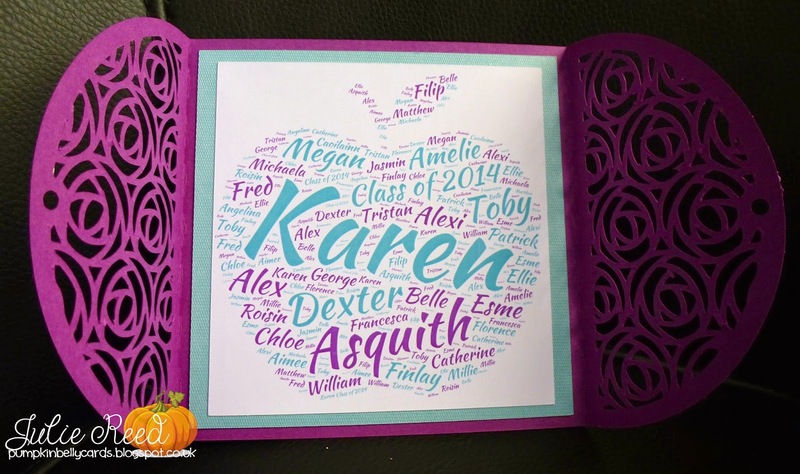 I have used a combination of Spellbinder Ovals and Circles (including Grand ones) to cut out the image and the mats for my Twisted Easel card. 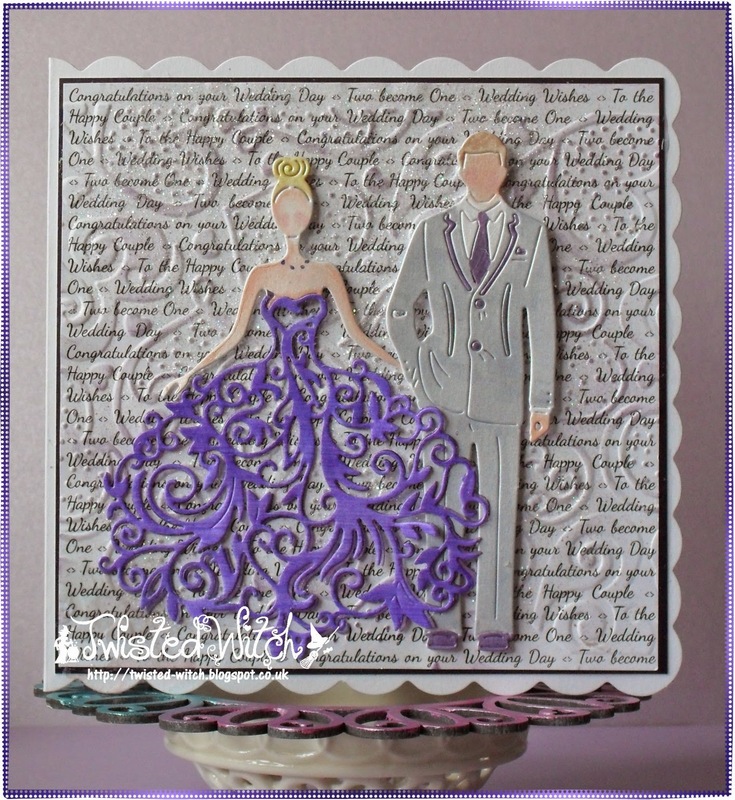 I have kept my card quite clean to accentuate the diecuts, the bride and groom, both from Tattered Lace. 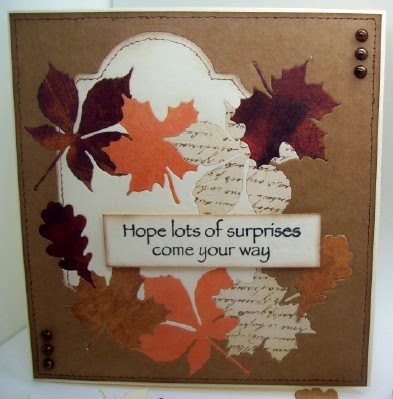 I have used some Impression Obsession leaf dies to create my card using a tutorial I found on YouTube. 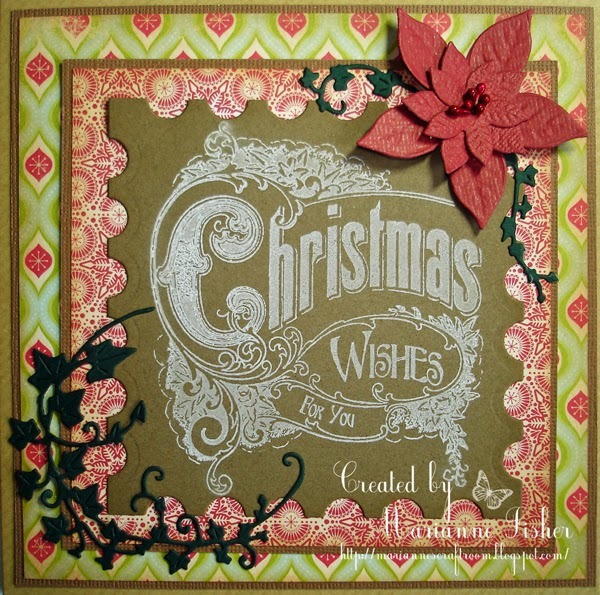 I've used a Crafts and Me/Sara Burrier digi stamp and teamed it with a fabulous dic cut panel from Sue Wilson. 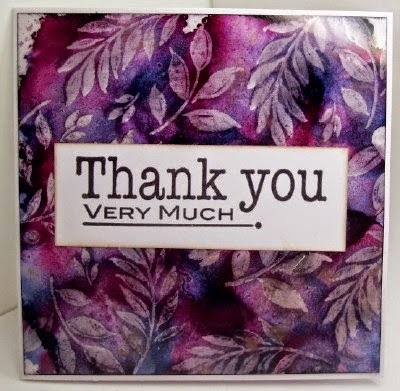 Mostly everything I used is from Stampin Up: Designer paper, framelit die, sentiment (embossed in gold), tag punch, flower stamp and matching punch and leaf die. Gold twine and stickles on the flowers are from my stash. 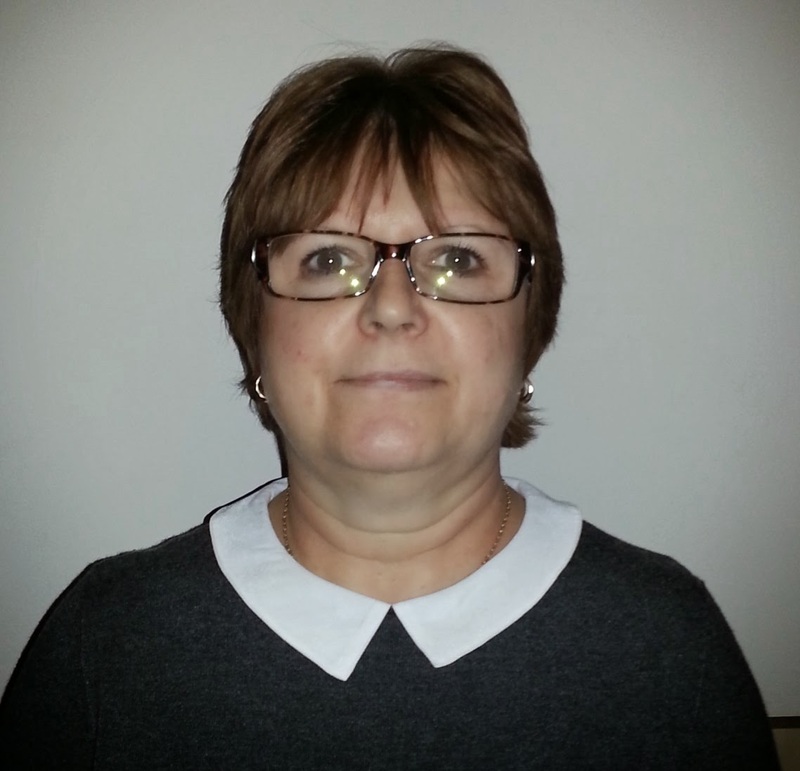 Hi I am Julie and am delighted to join CCM DT, I have been crafting for many years knitting from an early age taught by my Mum, I have only been card making for 6 years due to illness, it helped me so much and to be honest I don't even know where the idea came from in the first place, but I loved it and then a friend mentioned Create and Craft well that did it for me it opened a whole new perspective of card making I was amazed and learnt so much from it too, I could not be without it now, I have to make something everyday or I get withdrawal symptons, LOL. 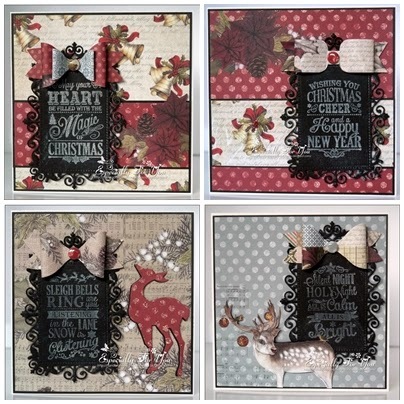 Four gorgeous cards, with the sentiment very much to the fore on all of them! 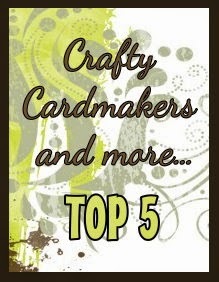 Congratulations to you all, please feel free to display our Winners' or Top 5 badge on your blogs. The winner has until 9th November to claim their prize, after which time I am afraid the prize will be forfeit. I'm hosting today and my challenge is 'It's Only Words'. I would like to see something that has the sentiment as the main focus or at least prominently displayed. 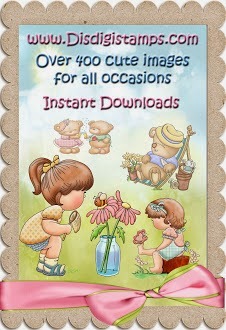 I'm not big on card sentiments - I prefer to let the image 'do the talking'! 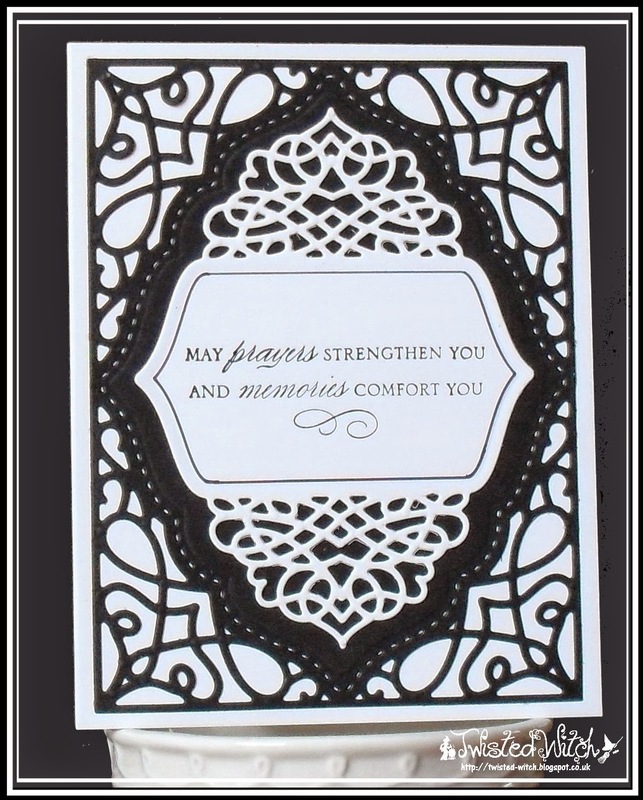 So for this one, I took a simple Photoshop Elements originated sentiment and added various die cuts and flowers, (almost) all courtesy of Sizzix. 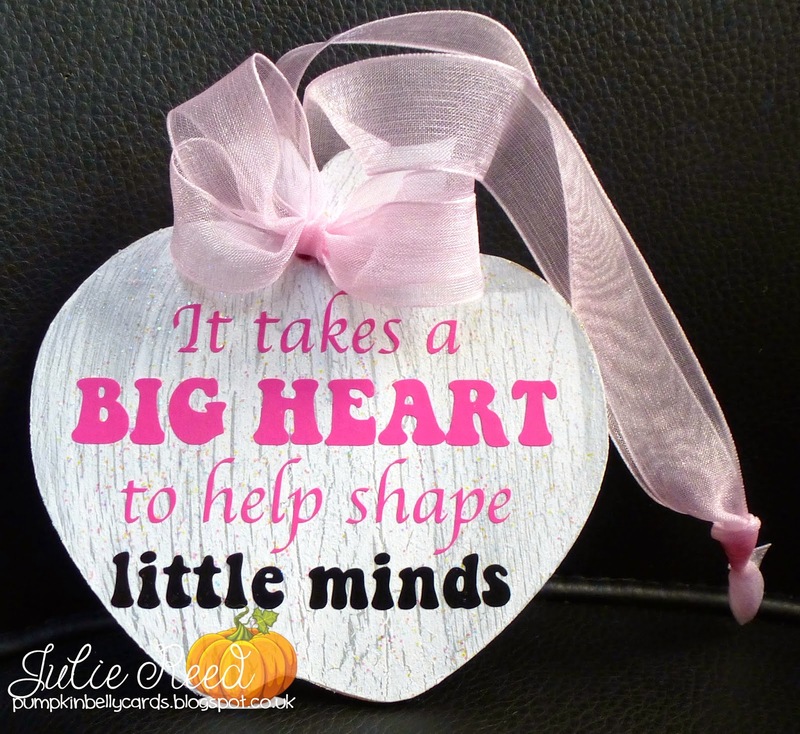 My sentiment is from Creative Expressions - Thoughtful Sentiments. 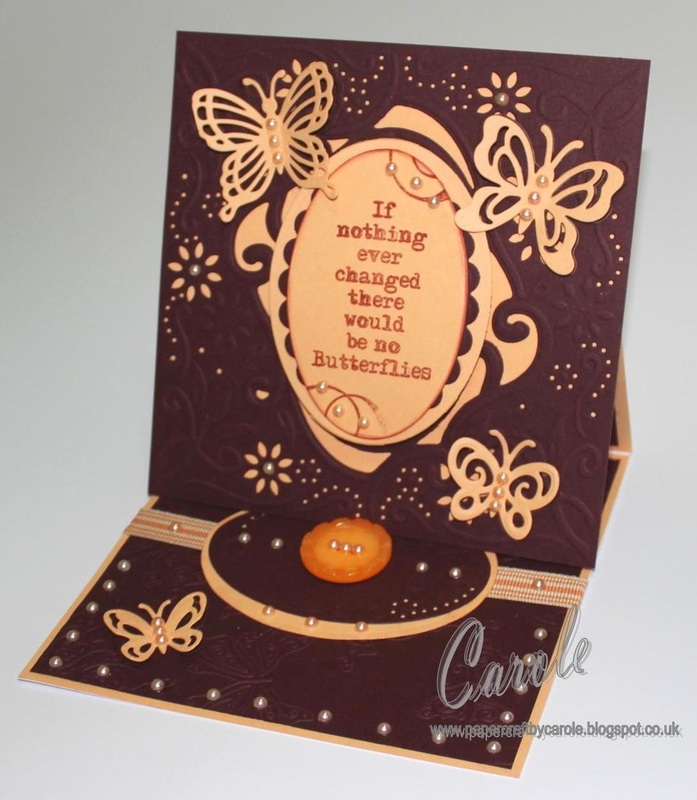 I have teamed this up with Die'sire Enchanted Create-a-card die and Essential Butterflies to make this easel card!! 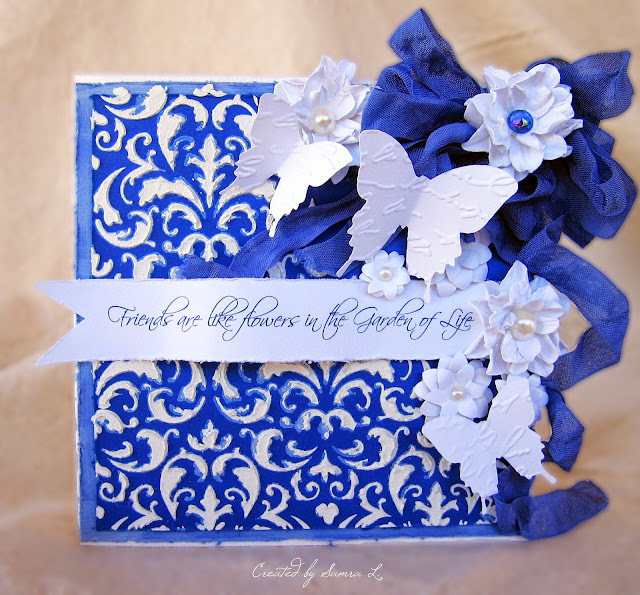 The sentiment stamp is from my stash, I have used dies and charms to make the embellishments and of course some ribbons, lace, pearls and glitter. 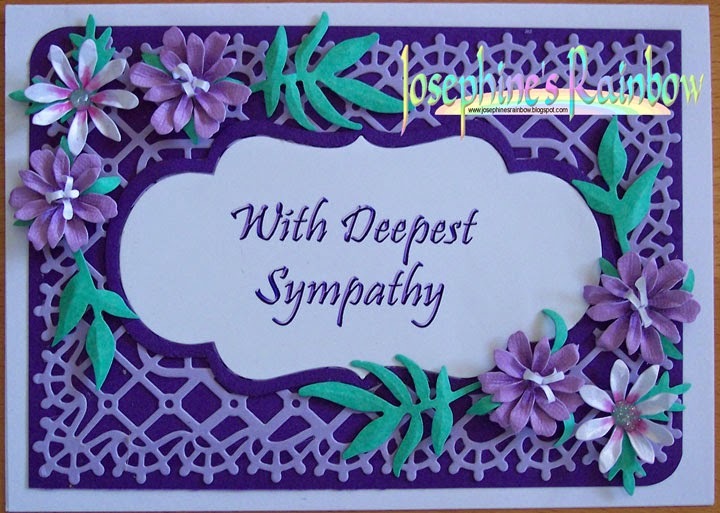 Mine is a sympathy card for a Neighbour who recently lost her Husband. 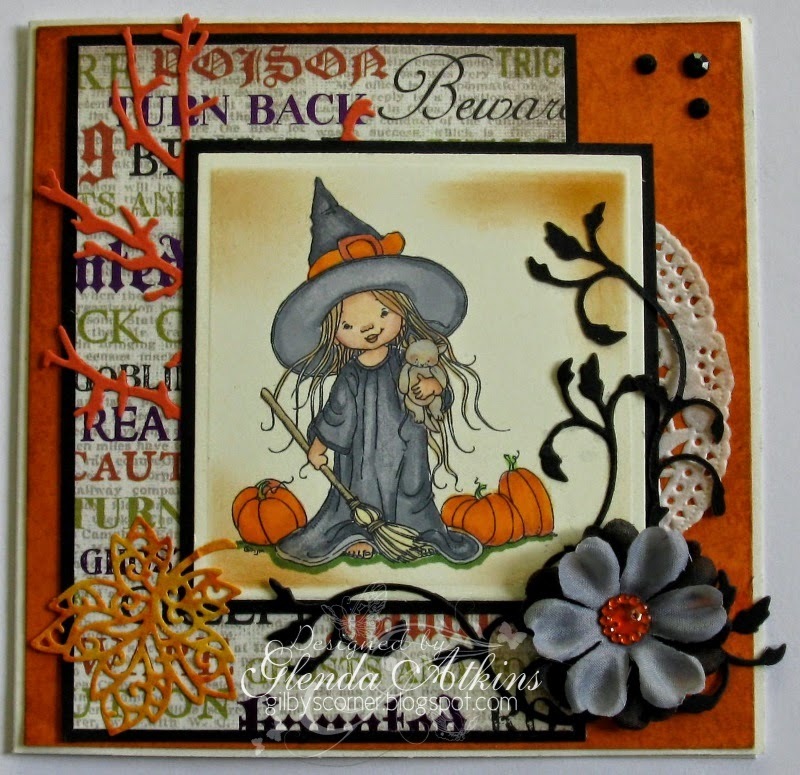 Anna Griffin sentiment, Spellbinders die. My sentiment is from Unity. 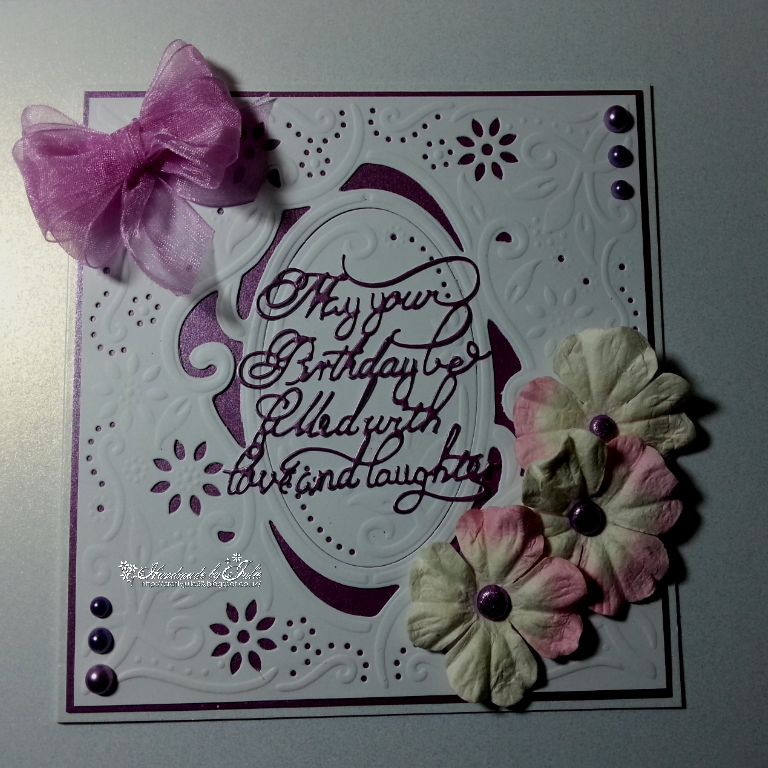 I used the Sizzix Square Flip-Its die for my swing card base, K & Co. double-sided papers, satin ribbon, lacy square and flourish die cuts, and a cluster of Wild Orchid Crafts flowers on a metal corner. I'm not much for words, so I decided to let my die sets do the talking! 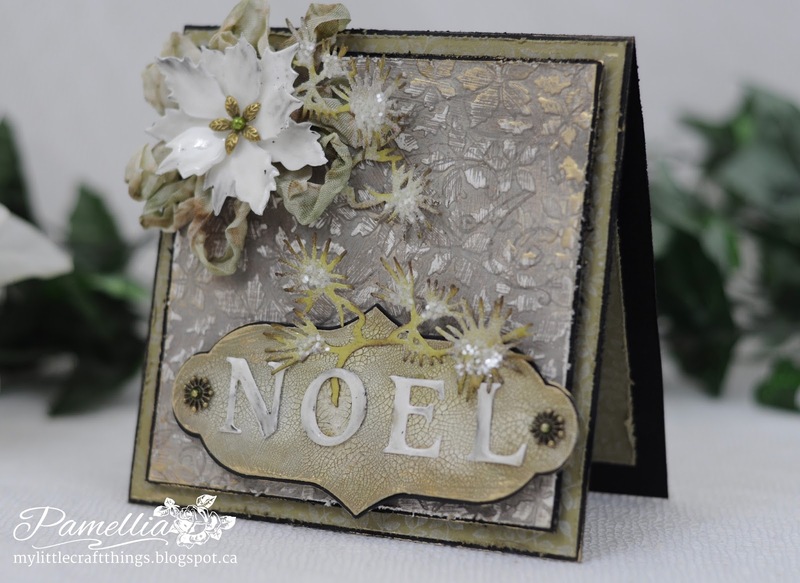 With the help of Spellbinders and Tim Holtz, I created a rustic country Christmas card with some faux porcelain embellishments. 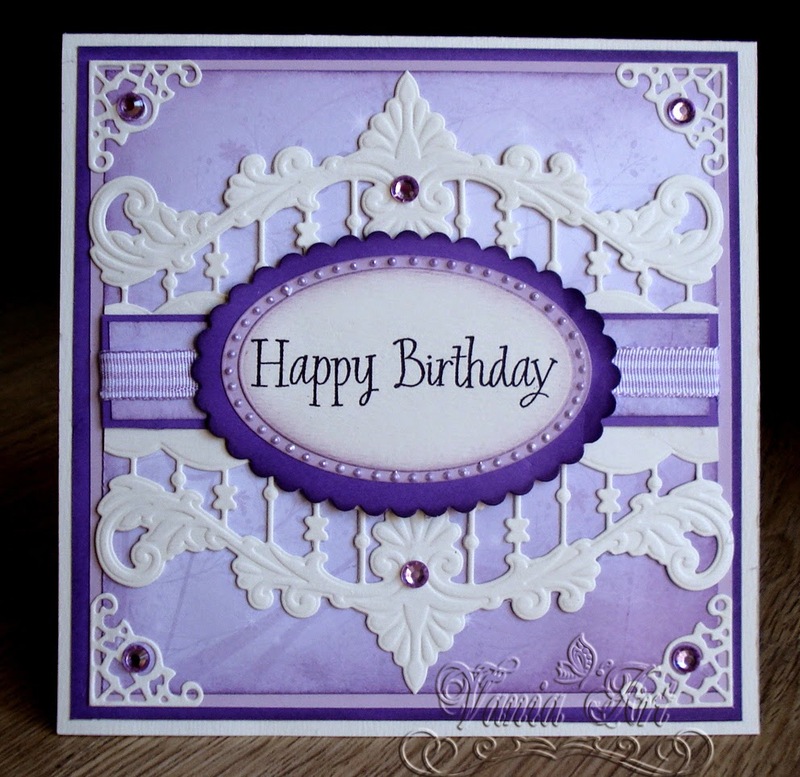 A quick and easy card from me using a lovely Hero Arts sentiment which I gold embossed. The two little birds, cut from gold miri, are a Memory Box Die and the papers are from my stash. I'm becoming only too aware that Christmas is speeding up on us, so my card is the beginning of my Christmas card list. 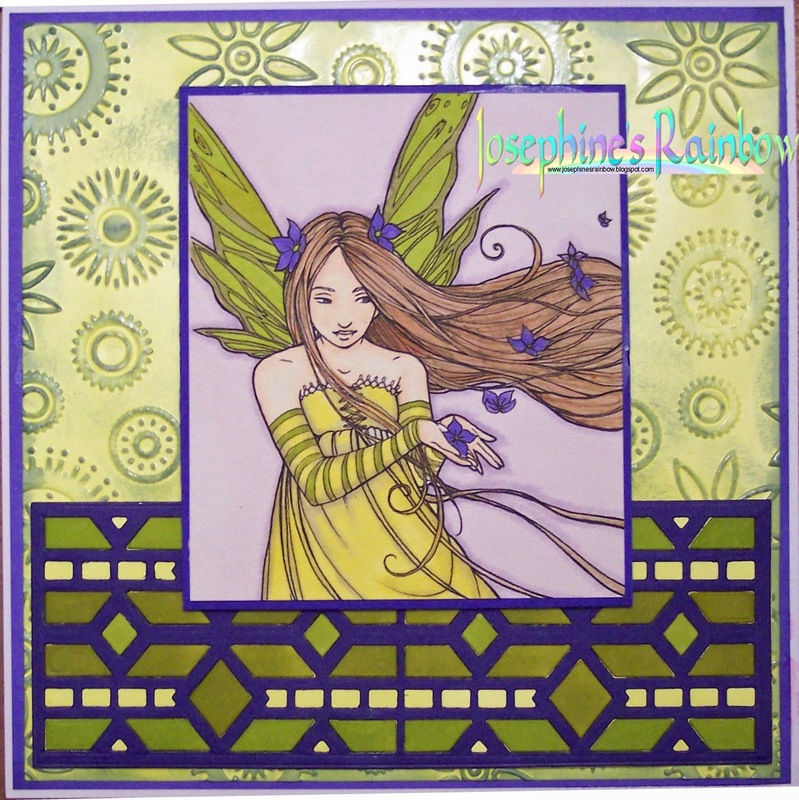 This one was made using a Woodware stamp, and some gilding flakes. 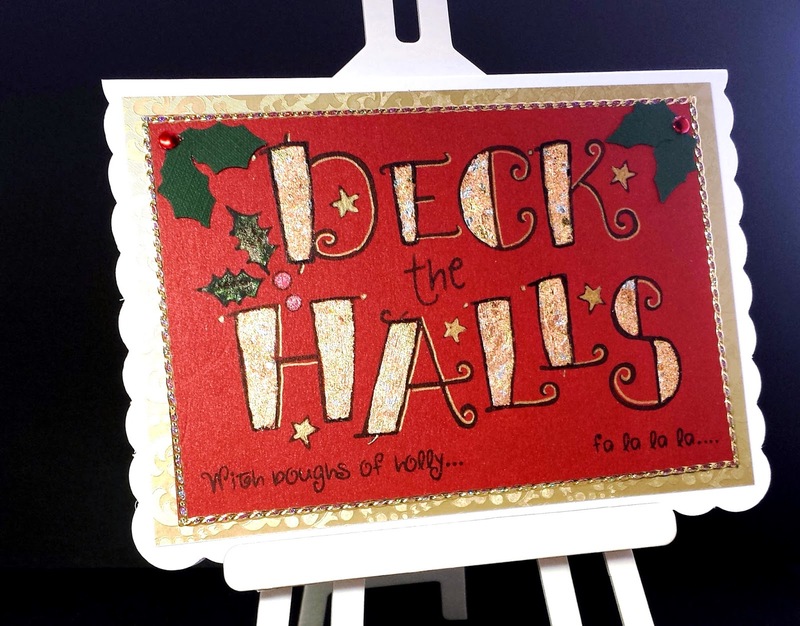 For my card I have chosen a sentiment by Woodware and a piece of handmade background made using Alcohol inks and Acetate. 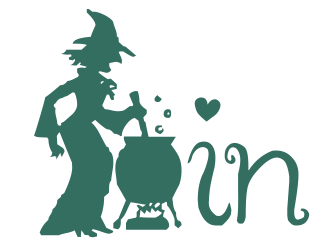 I am a retired career woman and I have loved crafting of all sorts since I can remember. 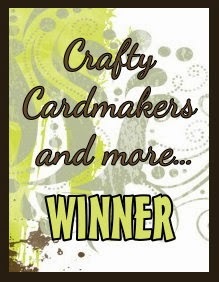 This current phase of card making has me totally addicted. I love to make anything out of paper, I just find it fascinating. I am starting (much to my delight and horror] to get interested in scrap-booking and the creations of albums :0). I am married to a most wonderful man and have one son and 4 step children, all adults at this point with lives and families of their own leaving me time to pursue my own interests. 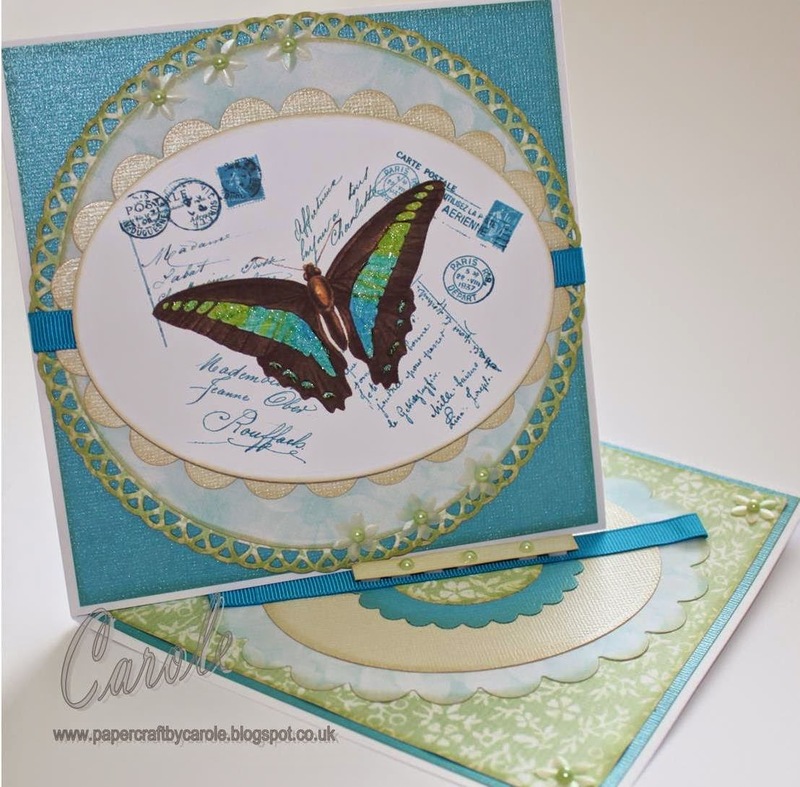 I am so pleased to have the opportunity to join Lin's team at Crafty Cardmakers and I look forward to seeing everyone's work and sharing my own with you ! 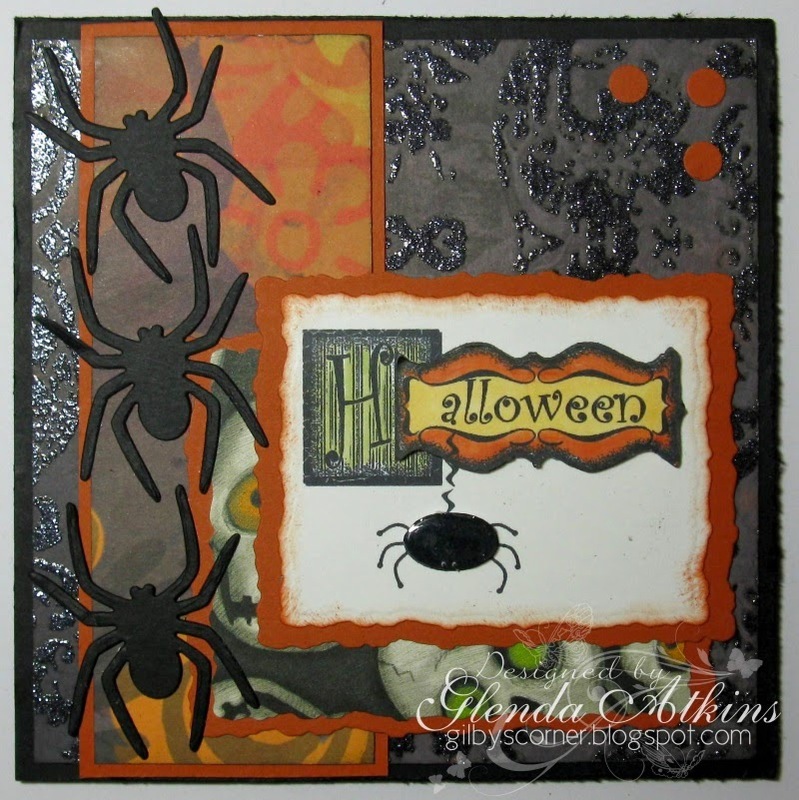 My sentiment is a TLC Creations digital image, spiders are die cut and the papers are from my Halloween paper stash. Distressed the edges with a Tim Holtz distressing tool. Before we get down to announcing the winner and top 5 from our last challenge, I have to comment on the entries we received. To those of you who read the challenge, and saw that we had a specific list of Bs to choose from, and entered appropriate creations with at least three of those Bs, thank you. However, well over half of our entrants, clearly didn’t read the post because they entered creations with entirely different Bs to the ones we listed right at the top of our challenge. I always put the challenge details at the top of the page so you don’t have to scroll through paragraphs of other stuff just to find what we are asking of you, so please, please, could you have the courtesy of actually reading those requirements before entering your card/creation in the linky. It’s not sufficient to see the title and assume you know what we are asking, nor is it sufficient to use a challenge directory website and assume you know what we are asking from there either. I feel as if I am banging a boring drum here, but I don’t think it’s much to ask that you just check that what you are adding to the linky actually matches what we have asked you to do! Some people even entered 5 Bs NONE of which were on our list! Sadly I had to delete a number of entries because it’s not fair on the people who have read and entered an appropriate piece. Right enough of the moaning, down to business …. The winner has until 26th October to claim their prize, after which time I am afraid the prize will be forfeit.